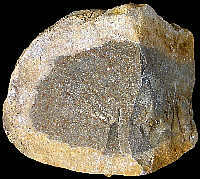 Material (geologic): Middle Jurassic (Dogger, Late Bajocian) flint. Mode of occurrence: Occurring in continuous beds 5 to 6 cm thick, highly jointed, jutting out from the compact light brownish grey to light reddish tan limestone. Middle layers of an outcrop at the top of a cliff face. Cortex: Fresh, rough, grey-white, 1 cm thick, transition sharp. Pattern: Flecked with pale-coloured specks. Appearance: Homogeneous material, although highly jointed, dull and opaque, moderately smooth, medium-grained. Grains: 50 %, white, pale yellow, ochre, rounded with high sphericity; balanced distribution of grains measuring100 µ (sponge spicule sections) and ranging between 500 and 1000 µ (ooliths, entrochi); rare grains of 3 mm max. Grain composition: Rare foraminifera, numerous sponge spicules, ooliths (occasional aggregates, entrochi, fragments of pelecypods and of Cyclostoma bryozoans. Co-ordinate precision: The coordinates given were taken from a large-scale map, and are within 50 metres of the actual exposure. The latitude/longitude coordinates are a direct transformation of these data on WGS84 and are accurate to the same level. The high precision to the second is given to prevent the introduction of a rounding-error. The location can be found on the 1:25 000 topographical map sheet 3130 E of the French Institut Géographique National. Geology: According to the geological map, the parent-rock belongs to unit J1c of late Bajocian age. Map of all sampled localities of Bajocian flint in the Bugey (PDF, 190 KB, opens in new window). 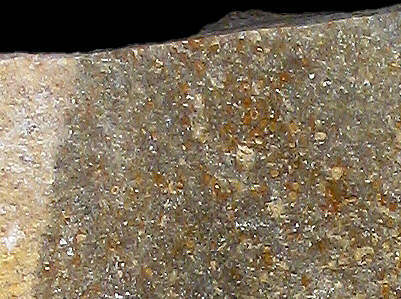 Other types of flint: At this exposure, three types of flint can be found, all of Late Bajocian age, in the upper layers Bj4a flint, in the middle layers the Bj4b-type descibed on this page, and in the lower part the Bj4c variety.